Markets came off their day highs, amid weak European cues, to end with marginal gains on Tuesday led by software major Infosys. The Sensex ended up 84 points at 18,793 and the 50-share Nifty advanced 29 points to end at 5,705. 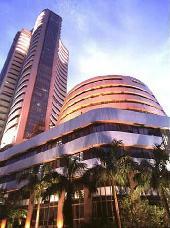 Earlier in the day, the markets opened higher and the Sensex had touched an intra-day high of 18,885. The European markets gave up early gains and turned negative on as persistent concerns over a slowdown in global growth and its impact on corporate earnings weighed on investor sentiment. CAC, DAX and FTSE 100 were down 0.2-0.5% each. The Asian markets ended on a mixed note as concerns over global growth prospects, especially in the world's second-biggest economy China, and expected weak US corporate earnings. The Shanghai Composite advanced 2% to close at 2,115 and Hang Seng advanced 0.5% to close at 20,937. While, Nikkei, Seoul Composite and Taiwan Weighted closed on a weak note, down 0.3-1% each. Back home, uncertainty over the political scenario has surfaced once again. Now, the Bahujan Samaj Party leader Mayawati has said that she would decide tomorrow whether to support the incumbent UPA government or not. She also said that her party may support government's decision to allow 51% foreign direct investment in multi brand retail only if it proves to be beneficial for farmers. Among financials, private bankers were among the top gainers on hopes of reporting better net interest margins in the second quarter. ICICI Bank gained 1.1 per cent while HDFC Bank ended up 0.8 per cent while SBI inched up 0.5 per cent. Software shares gained amid a weakening rupee. Infosys ended up 1.9% at Rs 2,537 while TCS and Wipro ended with marginal gains. Meanwhile, Larsen & Toubro was the top gainer among the Sensex stocks, up 2% to close at Rs 1,628. Sun Pharma, Sterlite Industries, HUL, Cipla, Tata Steel, Hero MotoCorp, HDFC Bank and Tata Power also ended higher by 1-1.8% each. The cut of deadline will be the date when the cabinet clears the proposal. BHEL, Hindalco, Gail India, Bajaj Auto, NTPC, Tata Motors, HDFC, ONGC and RIL were also among the losers. On the sectoral front, BSE consumer durable index was the top sectoral gainer. the index advanced 1.5% or 103 points to close at 7,612. Healthcare, IT, FMCG, capital goods, bankex and metal indices also ended higher by 0.4-1% each. At the same time, oil & gas, power and auton indices were among the notable losers, down 0.1-0.4% each. Among the individual stocks, Shakti Pumps surged 8% to Rs 57.20 extending its previous day's 6% rally after the company said it will allot 1.2 million shares M.L. Securities and Finance, the person other than promoters, at Rs 88 per share (adjusted to bonus shares) on conversion of warrants. Ranbaxy Laboratories ended higher by 2% at Rs 539 after the pharmaceutical company said said its wholly owned subsidiary has launched the authorized generic cevimeline hydrochloride capsules in United States under an agreement with Daiichi Sankyo, Inc.
Emkay Global Financial Services continued its southward journey and was locked in lower circuit of 10% at Rs 25.25 for a third consecutive day on the National Stock Exchange (NSE). Bajaj Electrical moved higher by 7% to Rs 225 on reports that the company is trimming its low-margin engineering and projects (E&P) business to strengthen its balance sheet. Shares of Vijay Mallya led UB Group Companies - United Spirits, United Breweries and United Breweries Holding recovered from their yesterday's fall and ended higher by more than 5% each on the National Stock Exchange (NSE). United Spirits surged 6% to Rs 1,247 on reports that Vijay Mallya led UB Group company has signed an out of court settlement with Allied Blenders and Distillers (ADB) over Officers' Choice. The broader markets were in-line with the benchmark indices. The BSE mid-cap index advanced 0.5% or 31 points to close at 6,680 and the small-cap index advanced 0.3% or 23 points to close at 7,157 levels. The overall breadth was positive as 1,506 stocks advanced while 1,306 declined. Has the flat C for US equities begun?